This is a scam where the thief posts an item for sale on the internet for much less than it's actual worth. If you reply to his ad, he will give you a story about how his item is "in storage" with a shipping company, usually boxed up or in a shipping container, as an excuse for you not being able to look at it. He will be unavailable, on a business trip or something, so is having the "shipping company" take care of everything. When you send the "shipping company" the money (Western Union of course), the "shipping company" will deliver the item. Of course, when you send the money, you never hear from him again, and the item is not delivered. Here's an example I found on craigslist, 9/29/07. Now this is probably a copy of a real ad, with just the price and email address changed. Note the english is good, and the price is far far below the actual value of this model in 2007. 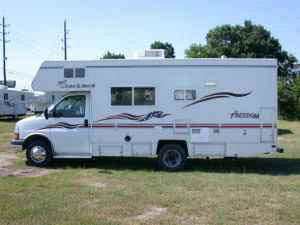 I have for sale a 2004 Coachmen 23' Freedom Class C Motorhome that has a GVWR of 12,300lbs and comes with a dependable, Chevrolet 6.0L V8 engine and a automatic 4-speed transmission with tow/haul button and only 55543 miles. This unit runs and drives great (motor and generator run great). It has: a Neutral/Blue colored velour/cloth interior, tilt steering wheel, cruise control, privacy glass, cold blowing dash air conditioning, cold blowing single Duo-Therm Brisk Air rooftop air conditioning and a AM/FM CD player radio. It also has: bucket seats, rear heater/furnace, center console with drink holders, driver and passenger side airbags, overhead bunkbed, miniblinds, lots of nice wooden cabinets with built-in TV hookup, nice wood floor, dinette table for 4 that folds down into a bed, sofa that pullsout into a bed, dual stainless sink, Samsung microwave, 3 burner Magic Chef stove, Dometic Americana refrigerator/freezer with automatic refrigerator temperature control, digital instrument panel for battery condition, fresh water, gray water and lp gas, pantry/cabinet, nice rear bathroom with mirrored medicine cabinet, large hanging closet and a shower, 13' A&E Systems awning, 30 ampere hookup, chrome front bumper, running boards/entry steps, outside storage compartment, single manual pullout entry step, spare tire, rear trailer hitch and a Onan Microlite 2800 gasoline generator (Model: 2.8KVFA11574K) with only 711 hours. It has factory steel wheels with chrome simulators and good Uniroyal tires size LT225/75 R16. The interior is in good condition. The White paint & body is in good condition with the exception of a spot on the passenger side rear compartment door and showing some normal wear. To show you how this typically can go, I emailed the "seller". Here's my emails and his replies. Note the poor english, but they don't all have poor english. I'm interested in your motorhome, where can we look at it? Gee, that sounds great. Where is it being stored at and how do I pay? 6) upon receive a 3 days inspection will start and 100 miles test drive. 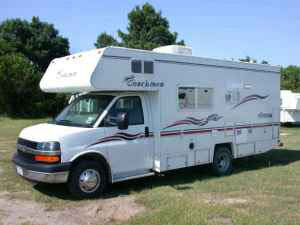 7) you will accept the camper after the 3 days inspection so the shipping company can send the funds to my account. If you agree with this 7 steps please replay me back with your full name, shipping address and phone number so we can move forward. Thanks and waiting for your replay. Sounds good, just the motorhome we've been looking for. ID number of your shipping container? And what is your name and phone number? Hi David, name of the shipping company is Das Delivery, the warehouse is in Atlanta Georgia, you can find more information about them at www.das-delivery.com, i will request a referance number in order to check it on line to see that the RV is in there posesion, also if you have other questions please don't hesitate to ask me. Waiting for your replay. I hope we can conclude this sale soon as agreed. Please do get the referance number and send it to me so I can check it online. You forgot to send me your name and phone number. I have a couple of questions about the layout of the RV I would like to ask you. I don't expect to hear back from him after this, he SHOULD have figured out that I'm on to him after that email, but some are persistant.